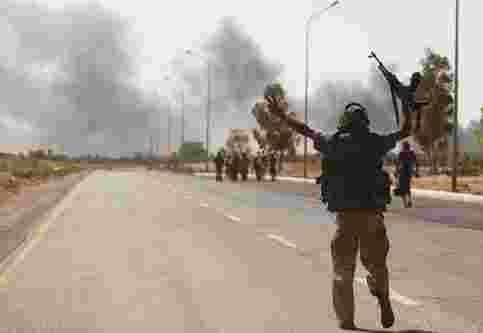 Forces of Libya’s new rulers, the National Transitional Council (NTC), broke weeks of resistance from Gaddafi loyalists to enter Sirte in recent days, but heavy gunfire has prevented them from reaching the city centre. Anti-Gaddafi units who approached the city from the east were, for a second day, pinned down at a roundabout approximately 2 km (1.5 miles) from the centre of Sirte. “Gaddafi forces have placed a lot of snipers around the roundabout and it is not easy for us to advance forward until we get rid of the snipers," said Ahmed Saleh, an NTC fighter there. Explosions of artillery rounds and exchanges of small arms fire could be heard from the roundabout. NATO warplanes, which have been pounding targets in Sirte to clear the way for NTC forces to enter, were flying overhead. Taking Sirte would be an important symbolic trophy for Libya’s new rulers, and would bring them closer to finally gaining control of the whole country more than a month since their fighters seized the capital Tripoli. Gaddafi built lavishly, turning his birthplace - once a sleepy coastal town - into an informal second capital. It was in the marble halls of Sirte’s Ouagadougou conference centre that he hosted heads of state for summits designed to burnish his image as “African king of kings." Libya’s new rulers are under pressure to bring the fighting to an end. Humanitarian organizations have raised the alarm over conditions for civilians in Sirte and in the second pro-Gaddafi bastion, the desert outpost of Bani Walid southeast of Tripoli. Scores of civilians in cars laden with personal belongings streamed out of the town to both the east and west on Monday. “We are very concerned about the people inside and near Bani Walid and Sirte," Georges Comninos, who heads the International Committee of the Red Cross (ICRC) in Libya, said in a statement. ICRC spokesman Steven Anderson said the agency was trying to get access to people trapped in both towns and provide aid to thousands of people who have fled. People inside the two besieged Gaddafi bastions had appealed by e-mail and phone for help, he said. “People are talking about medical supplies and food running short." NTC fighters and people who have fled Sirte have alleged that pro-Gaddafi fighters were trying to prevent civilians from leaving, effectively using them as human shields. “Gaddafi’s forces have surrounded the area, closed it off, by shooting at people," said a man called Youssef, driving away from Sirte with his wife. “There are a lot of people who want to get out but can’t." Gaddafi’s fugitive spokesman Moussa Ibrahim said on Monday the ousted leader was in Libya and “very happy that he is doing his part in this great saga of resistance". Ibrahim would not comment further on Gaddafi’s whereabouts, but said he himself had been in Sirte the previous day. “The situation is quite bad."